Anyone who attends TRC for any length of time will soon become familiar with the name of C. H. Spurgeon, pastor of the Metropolitan Tabernacle in Southwark during the latter part of the 19th century. An earlier post to this blog outlined Spurgeon’s significant role in the establishment of TRC as a gospel witness in Upper Tooting, London. Estimates of upwards of two hundred churches were started by Spurgeon, the people of the Metropolitan Tabernacle and the men of the Pastor’s college. In London alone, Spurgeon claimed that over forty churches were started. Now, my dear hearers, one word with you. There are some persons in this audience who are verily guilty in the sight of God because they do not preach the gospel. I cannot think out of the fifteen hundred or two thousand persons now present, within the reach of my voice, there are none who are qualified to preach the gospel besides myself....This is a very serious question. If there be any talent in the Church at Park Street, let it be developed. If there be any preachers in my congregation let them preach.... I have preached this sermon especially, because I want to commence a movement from this place which shall reach others. I want to find some in my church, if it be possible, who will preach the gospel. And mark you; if you have talent and power, woe is unto you if you preach not the gospel. When I was sore sick some three years or more ago, I walked about to recover strength, and walking through the town of Wandsworth, I thought “How few attend a place of worship here. Here are various Churches, but there is ample room for one of our own faith and order, something must be done.” I thought “If I could start a man here preaching the Word, what good might be done.” The next day, some four friends from the town called to see me, one a Baptist, and the three others were desirous of baptism, “Would I come there and form a Church?” We took the large rooms at a tavern, and preaching has been carried on there ever since. Beginning with four, the Church has increased to one hundred and fifty. In May 1863 Spurgeon joyfully opened their new chapel, capable of accommodating nearly 700 persons, and costing £3,000, towards which he contributed a considerable amount. God sparing my life, if I have my people at my back I will not rest until the dark county of Surrey be covered with places of worship. I look on this as the beginning of the end. I announce my own schemes: visionary they may appear, but carried out they will be. It is only within the last six months that we have started two churches — one in Wandsworth and the other in Greenwich, and the Lord has prospered them. The pool of baptism has been stirred with converts. And what we have done in two places I am about to do in a third, and we will do it not for the third or the fourth, but for the hundredth time, God being our helper. I am sure I may make my strongest appeal to my brethren because we do not mean to build this as our nest, and then to be lazy. We must go from strength to strength, and be a missionary church, and never rest until not only this neighbourhood, but our country, of which it is said that some parts are as dark as India, shall have been enlightened with the gospel. I have constantly letters like this, “Sir, I live in a village where the gospel is not preached ....cannot you do something for us? You have many young men training for the ministry, could you not send a friend to preach in my drawing room?” Then comes another — “Sir, the chapel has been shut up in our village a long time, could you not come and help us?” This happens every week, and your minister feels that as long as ever he has a man, he will say, “I will do it for you;” and as long as he has any money of his own he will say, “Oh, yes, I will do it for you;” but every now and then he wishes that he had some who would stand by him in larger attempts. It goes without saying that Spurgeon was but one man and that he wasn’t the sole labourer behind the planting of upwards of two hundred churches in his lifetime. There were four key places Spurgeon found assistance—his own church, other ministries, the Pastor’s College and the London Baptist Association. More will be said about this, Lord willing, in another post. Our dear friend Rob Hughes writes here about a recent evangelistic outreach in London. 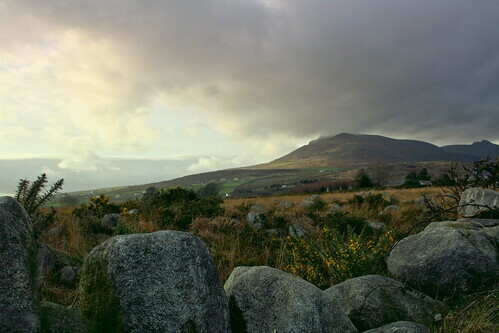 Mourne Mountains, County Down, originally uploaded by Doug McMasters. Last week, Royale and I enjoyed time in Northern Ireland. The highlight for us both was the warm hospitality from the Castlewellan Presbyterian Church, where I spoke for a united church Bible conference. Bill Parker and the church were wonderful hosts. We enjoyed guided walks and drives around the area as a part of that hospitality. Those outings and the few days we spent in Portrush, County Antrim, near the Giants Causeway, I captured with some photographs, available at Flickr for viewing. Last December, Royale and I enjoyed a visit to impressive Hampton Court Palace. Of the many things to see in that grand place, one section particularly captured my attention; the King’s Chambers. Designed to awe and impose, with its walls covered in ornate murals, a large gathering room welcomed those who desired the presence of the king. The invited were allowed to the upper level by way of a large winding staircase that opens into a guardroom wall-covered in weapons. To see the king, one passed through a series of rooms, each arranged to convey the king’s grandeur, wealth, prestige and power. Before one was allowed beyond the lower entrance, up to the upper floor and through the several rooms to the throne room and the king’s presence, the visitors were examined to see if they were suitable. Did they deserve the king’s personal presence? Were they properly attired? Did they carry the right credentials? Was their business pertinent? When I viewed the king’s chambers and heard of the examination folks received to see the monarch, my thoughts brought me to consider the Lord, who in his exalted place resides in splendour no earthly king understands. In fact, attempts to understand Him, all similes and metaphors, fail to connect and humanity is left no capability to fully take in the vastness of God’s glory. If we desired to enter His chambers, could we pass the exam and gain access? Are we dressed correctly? No, all our righteousnesses are as filthy rags in His sight. Are we positioned well enough? No, we are a son of Adam, who disobeyed at the first and ran from His presence. Are we powerful enough? Only a fool would think that possible. If these questions depended on us, we would be outside, where we deserve to be. Entrance into the inner private chamber of the King of kings, without any dress, credentials or demand of business to offer? Amazing! How did this entrance happen? It was through the love of God for us in the death of Christ, who bore our punishment. His blood stands as the basis for our forgiveness and right of entrance.